U.S. Army Captain Is Suing Obama Over Legality Of The War Against ISIS : The Two-Way Capt. Nathan Michael Smith, who is currently on active duty in Kuwait, says he is concerned that an "illegal" war "forces him to violate his oath to 'preserve, protect and defend' the Constitution." 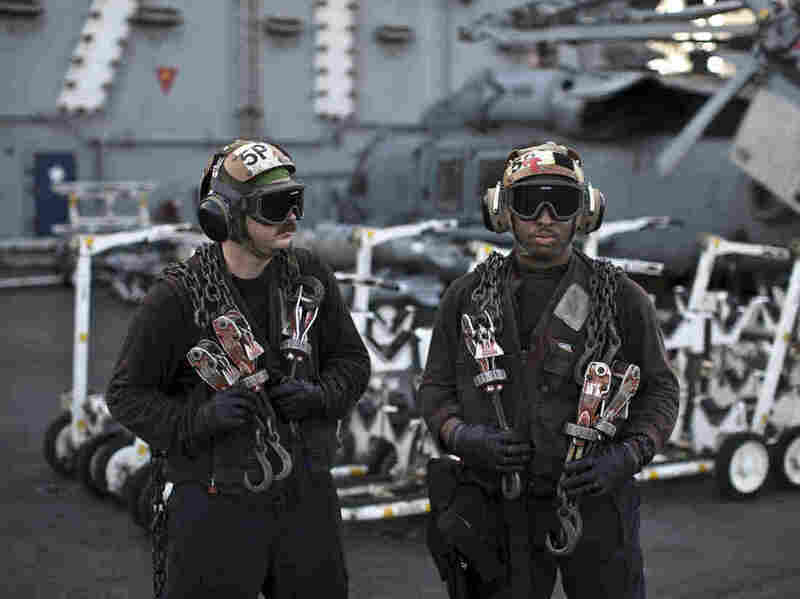 U.S. Navy air wing captains pause on the flight deck of the aircraft carrier USS Theodore Roosevelt last September. Every day, the steam-powered catapult aboard this massive ship flings American fighter jets into the sky, on missions to target the extremist Islamic State group in Iraq and Syria. A U.S. Army captain has filed a lawsuit against President Obama over the legality of the war against ISIS in Iraq and Syria. Capt. Nathan Michael Smith, 28, who is currently on active duty in Kuwait, filed the lawsuit Wednesday in U.S. District Court for the District of Columbia. He argues that the war is illegal because it lacks congressional authorization. He says the ongoing military action violates the 1973 War Powers Act. "Under the War Powers Act, every time [a president] notifies leaders of military strikes, his power to carry them out without congressional approval extends another 60 days," as NPR's David Welna has reported. "The President did not get Congress's approval for his war against ISIS in Iraq or Syria within the sixty days, but he also did not terminate the war. The war is therefore illegal. The Court should issue a declaration that the War Powers Resolution requires the President to obtain a declaration or war or specific authorization from Congress within sixty days of the judgement, and that his failure to do so will require disengagement, within thirty days, of all United States armed forces from the war against ISIS in Iraq and Syria." The legal challenge comes as the U.S. expands its military presence in Syria. Nearly two weeks ago, Obama announced that the U.S. plans to send up to 250 additional military personnel to Syria, as the Two-Way noted at the time. They're joining the 50 already on the ground. The Two-Way has reported on the debate over the legality of the fight against ISIS in Syria and Iraq. As we noted, the Obama administration "authorized those strikes relying on an Authorization for Use of Military Force, or AUMF, passed in 2001, after the Sept. 11 attacks, and another one passed in 2002, which began the war against Iraq." "That argument is controversial because the Islamic State is at odds with the leadership of Al Qaeda and its affiliate in Syria, the Nusra Front. Critics contend that the administration is stretching the Sept. 11 authorization too far by applying it to an organization that did not exist in 2001 and that operates far from Afghanistan. "The administration has countered that its position is legitimate because the Islamic State used to be a Qaeda affiliate in Iraq during the Iraq war." Smith's lawsuit counters that the president has "exceeded his authority" under the 2001 and 2002 AUMFs, because the Islamic State played no part in the attacks of Sept. 11, 2001. Obama has said that he is acting according to his "constitutional and statutory authority as Commander in Chief." Last year, however, his administration sent Congress "a request for formal authorization to use military force against the extremist group," as the Two-Way reported. This lawsuit counters that the president's powers do not override the obligation to "obtain from Congress a declaration of war or specific statutory authorization in order to wage the war against ISIS." Smith stresses in court documents that that he personally "believes that the operation is justified both militarily and morally." But he says he is concerned that an "illegal" war "forces him to violate his oath to 'preserve, protect and defend' the Constitution." As David reported last week, the fight is drawing new criticism from some lawmakers. For example, at a recent Senate Armed Services Committee hearing, Democratic Sen. Tim Kaine said: "I am deeply concerned about the legal basis for this war, both domestic and international."